Windows 7 is just around the corner, and Gateway's new 23-inch ZX6800 and 20-inch ZX4800 all-in-one PCs are ready for your greasy multi-finger gestures. They also include a bunch of custom touch-enabled apps for managing music, photos, and social networks. The $1400 ZX6800 has a resolution of 1920 x 1080 (1080p), and can also double as an HDTV—it has with a built-in TV tuner, remote control, 5.1-channel audio, and 5-watt stereo speakers. 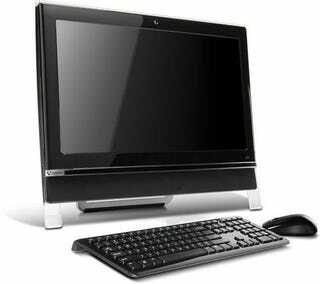 It's powered by a 2.33GHz Core 2 Quad 2.33GHz processor, 8GB of DDR3-1333 RAM, and 1GB ATI Radeon HD 4570 graphics. And for an all-in-one, the storage looks pretty damn sweet: a 64GB solid-state drive handles the OS and apps, and you get a 1TB hard disk for your media. Good stuff. The ZX6800 also has 8x DVD writer, multi-card reader, 802.11n Wi-Fi, Gigabit ethernet, HD webcam, 6 USB slots, and an eSATA slot. Meanwhile, the $750 ZX4800 is a 20-incher (1600 x 900) with a 2.1GHz Pentium Dual Core T4300 processor, 4GB of DDR2-800 RAM, 750GB hard disk, and pithy Intel X4500HD integrated graphics. The ZX4800 doesn't have the ZX6800's TV tuner or SSD, but the rest of its specs and connectivity are the same. Both Windows 7 all-in-ones are set to arrive in late October/early November.